John Davison Rockefeller was an American oil magnate and philanthropist. He was the founder of the Standard Oil Company, which dominated the oil industry and was the first great U.S. business trust. One of the richest Americans in history, John D. Rockefeller was the founder of the Standard Oil Company and, later, a philanthropist whose wealth bankrolled the Rockefeller Foundation. Hard-working and meticulous, Rockefeller started out small and then made his fortune via hard-nosed and sometimes controversial business tactics, which have since made him an entrepreneurial hero to some, a greedy fiend in the eyes of others. He started in the oil business, and by the end of the century the Standard Oil Trust controlled so many other interests that it fell afoul of anti-trust laws. In 1911 the U.S. Supreme Court called Standard Oil a monopoly and forced the Trust to separate into competing companies. By that time Rockefeller himself was no longer involved in running the business, having devoted himself completely to philanthropy since 1896. He gave away millions to schools, health organizations and civic projects through the Rockefeller Foundation, which endures today. John D. Rockefeller, Jr. was in the family business only briefly before devoting himself to philanthropy with the Rockefeller Foundation... the elder Rockefeller's grandson, Nelson Rockefeller, was a four-time governor of New York and vice president of the United States from 1974-77 under Gerald Ford. 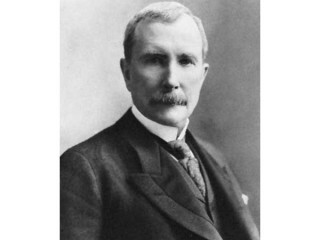 View the full website biography of John D. Rockefeller.